It's been a busy time at my place this week. There have been electricians and cabling contractors coming and going all week long. It's dusty work that they do, crawling in those tight ceiling cavities and cutting holes in my brand new walls. All this work was supposed to be carried out before the walls were installed but miscommunication between me and them (a long story) had left us without internet connection for 9 weeks! Anyway, I've been working around them but with dust flying everywhere from the holes they needed to cut in my walls there was absolutely no hope of casting any resin pieces. So instead, I've been working on some surface finishes on my resin bangles. And here are the results: What lovely little gems they are! I've just uploaded them to my website in time for last minute Christmas shopping. So take a closer look at these little lovelies..... perhaps you'll find just the thing for that special person on your Christmas list. Thanks Ancient Elf. Yes, they do look citrussy! Thank you for your following WHERE WOMEN CREATE! Your blog is beautiful... as is your artwork! I hope you have a very HAPPY NEW YEAR - each and every day of it! Thanks for you kind comment, Jo. You can see in my sidebar that your book is one of my favourite reads - I also love reading the WWC blog. 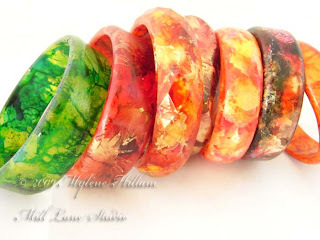 Just love the bangles Mylene, the colours are absolutely stunning! Thanks Robyn. I really love playing with this technique.